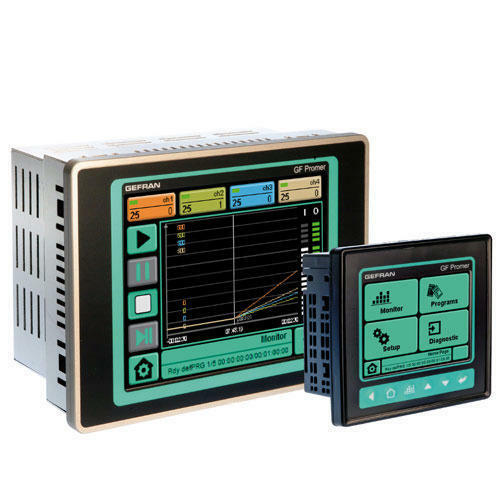 The user interface, based on an LCD TFT color touch screen (3.5” and 5.7”), is extremely simple to use. Configuration menus are identified by keys and icons that give immediate access to work program creation pages. Every program is identifiable with a number and a name, a time base definable in days/hours, hours/min, min/sec, different start and stop strategies. In addition, a number of cyclical repetitions of the program can be set. The programs are in easily scrollable list form and are selected directly on the screen. The steps are configured the same way with numbers and name, with up to 4 set point values for the 4 available loops, and step duration in the time base for the selected program. Cyclical repetitions of a sequence of contiguous steps can be easily created. To facilitate and speed up programming, there are copy, delete, and add functions for both steps and programs. When a program has been created, it can immediately be displayed in trend form to intuitively display correctness of the programming. Advanced control algorithms provide excellent management of process variables. Various types of control are available: ON/OFF, P, PI, PID both only heat or cool and double-action heat+ cool. In addition, the cool action can be set via indication of the cooling fluid used: air, oil, water. Calculation of the most appropriate process parameters is extremely rapid and efficient thanks to the use of sophisticated automatic tuning procedures. Advanced tuning lets you check the best PID parameters under all conditions. 5 properties (with latch, disable at switch- on, normal/symmetrical, absolute / deviation, direct/inverse). You can set LBA, HB, SBR alarms: alarm presence is displayed with an icon and described on the alarms page. Sayali Electrosystems has been involved in the large scale manufacturing, trading, exporting and supplying of industrial machinery since its foundation in 1994. Our gamut of products includes Potentiometer Linear position Sensors, Melt Pressure Sensors, Pressure Transducers, Load Cells, Thermocouples Resistance Thermometers and Controllers and Programmers, Photosensor, Vision Camera systems for Industrial Application,Scanner, Photosensor, Safty Curtain, Timers counters, Proximity switches, Vaccume Generator, Electromagnet., Load Cells, LVDT.We are a acknowledged brand in the market widely popular for our range of flawless products and superior quality.